Yesterday after work, I dashed over to my brother’s to pick up these cameras, both of which had been gathering dust in the back of my mom’s closet. Holy giddiness! These beauties were used by my mom in the late ’60s and ’70s. She’s an awesome photographer, and just holding them and thinking about all the cool sites and people she’s snapped with them makes me happy. After learning that both the Olympus 35 ED and the Canon Canonet QL17 G-III are comparable to Leicas, I’m even more eager to get them up and running ASAP. 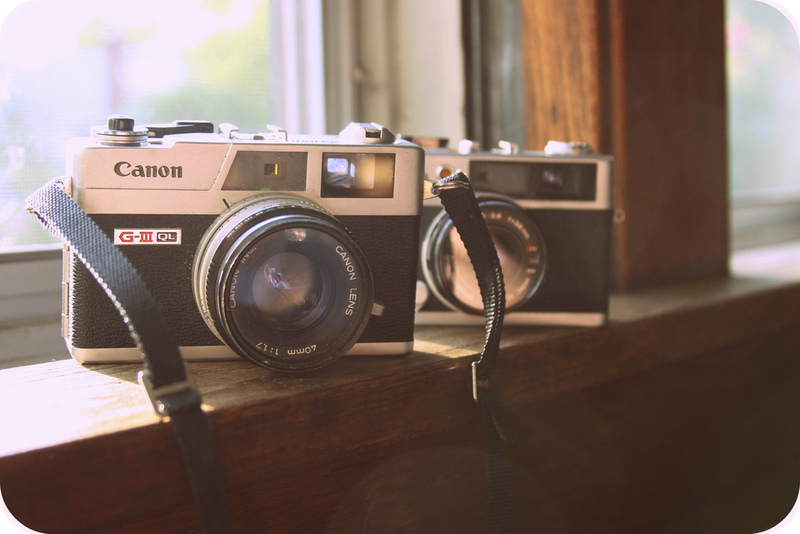 The slew of pretty Canonet shots in this Flickr group are inspiring. This one is extra dreamy. Do any of you shoot with film? Any tips for a brand-new beginner? This entry was posted in photography and tagged cameras, family, film by highplainsthrifter. Bookmark the permalink. I used to use film but not anymore because digital is so much more convenient. I do remember loving the excitement of waiting to collect my prints from the shop though, wonderful.